Melbourne's On-Q Cafe Bar can be described as the small glass club on the corner, or as Elton John would sing it, "the club at the end of the street." This rather humble looking place stretches itself three or four shops down Mount Alexander Road but doesn't explicitly claim such territory. Maybe its signs with no lighting during the day indicate its presence. However, come nightfall and patrons may only find one or two lighted signs. Newcomers may find On-Q Cafe Bar difficult to navigate at first. On-Q Cafe Bar is known for its live entertainment. 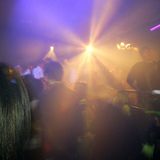 It is one of several popular nightspots that are relatively new to Melbourne suburbs outside of the CBD. This cafe bar has, by default, increased its visiting numbers in recent times following the regrettable closure of Moonee Ponds's high profile nightspot, OneBar. This joint offers the public a suburban choice. It is a great alternative to its CBD counterparts, especially if you don't feel like venturing out too far late at night or during the early hours of the morning. Unlike most CBD bars, On-Q Cafe Bar has nearby parking. Just remember not to drink too much or arrange for a teetotaller to drive everyone home.